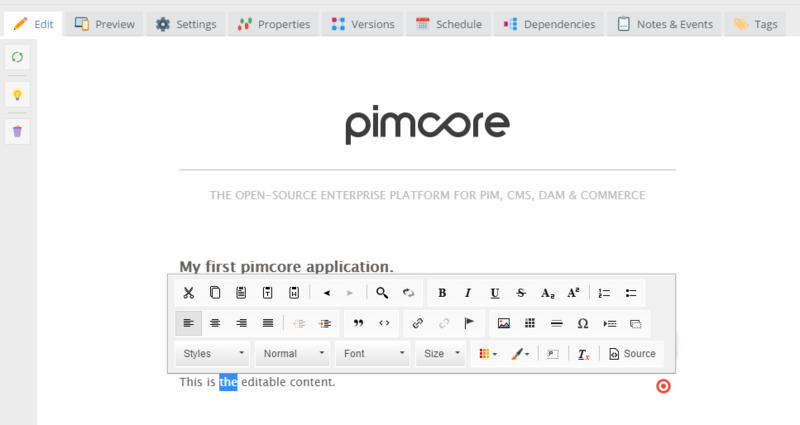 In this part, you are going to see a required minimum of knowledge, crucial for start developing with Pimcore. First of all, we need a controller. Let's call it ContentController.php. You have to put the file into the /src/AppBundle/Controller directory. For the moment we only have one single action called defaultAction(). In the defaultAction, we can put some custom code or assign values to the template. For this example we don't need any custom code in our controller, so the action stays empty for the moment. Create a new folder in /app/Resources/views and name it like the controller (in this case Content). Put a new PHP template into this folder and name it like our action in lowercase (default.html.php). 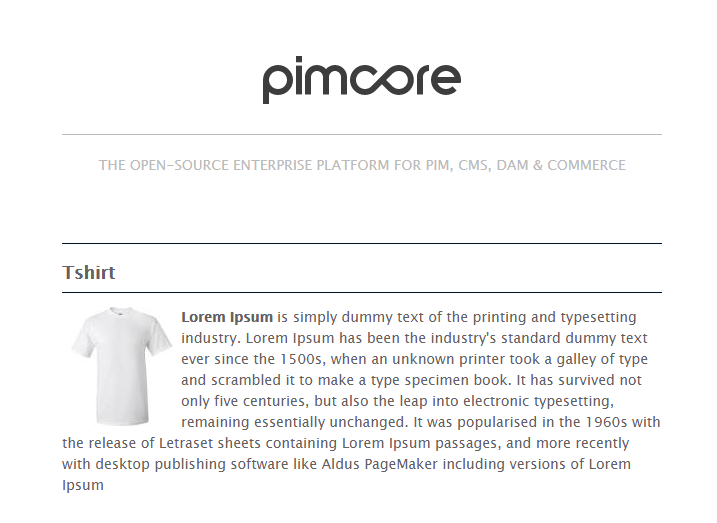 Pimcore uses by default an improved version of the Symfony PHP templating engine (PhpEngine) and therefore plain PHP as template language. 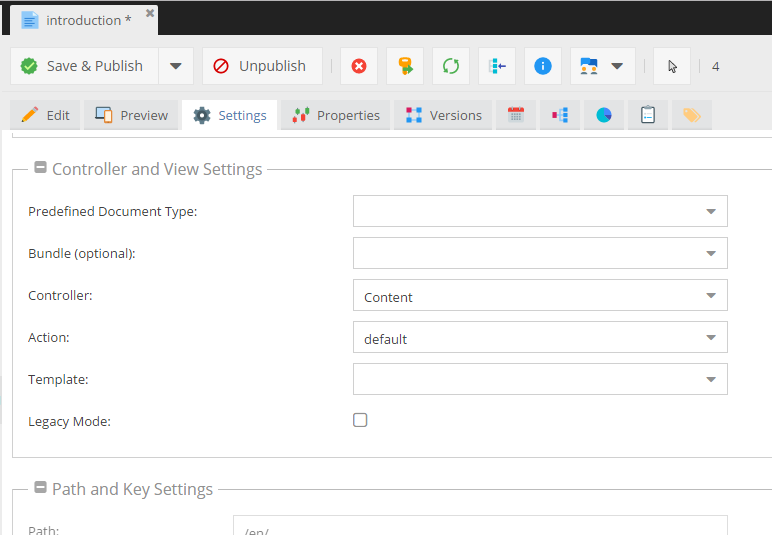 So you have the full power of Symfony templates with all Symfony functionalities available. 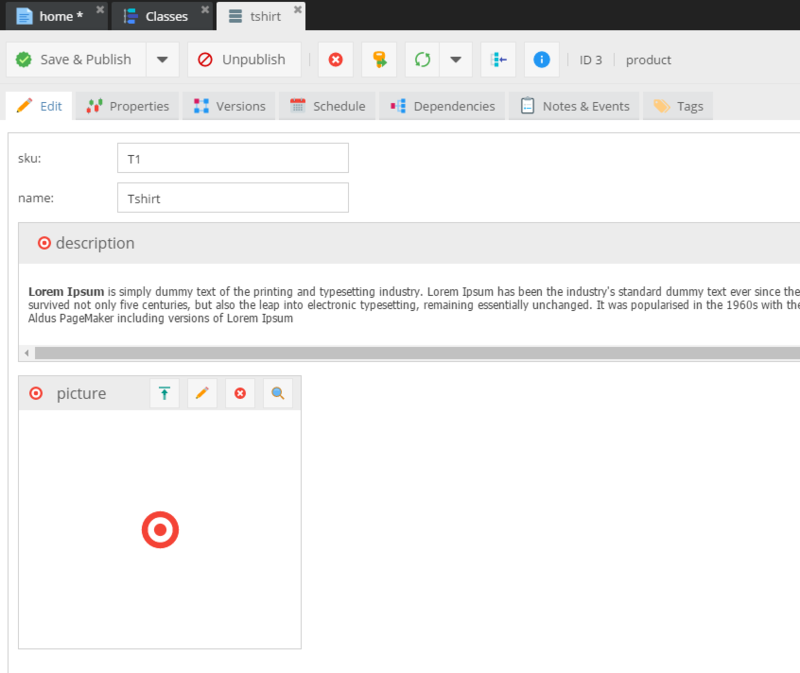 In addition to that, there are some Pimcore specific additions like the so called editables, which add editable parts (placeholders) to the layout and some custom templating helpers. We've improved the default Symfony PHP engine, by adding the $this context, which is basically the same as using the $view variable or local variables when using the default Symfony syntax. However the default syntax is still available and ready to use. For details concerning editables (like $this->input, $this->block, ...) see Editables. We tell the engine that we want to use the layout layout.html.php. The code <?php $this->slots()->output('_content') ?> is the placeholder where the content of the page will be inserted. 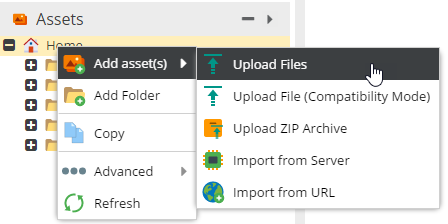 Now we need to connect the action to a page in the Pimcore backend, so that the page knows which action (and therefore also which template) needs to be executed/processed. 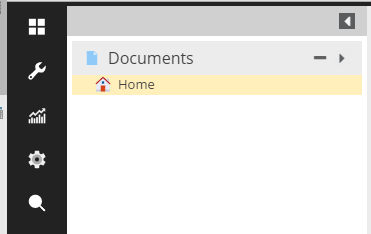 First, click right on Home in the Documents panel. Now select the tab Settings in the newly opened tab. Select the name of the controller and the name of the action in the according fields. $this->editmode is a standard variable (is always set) to check if the view is called from the Pimcore admin backend and gives you the possibility to do different stuff in editmode and in frontend. 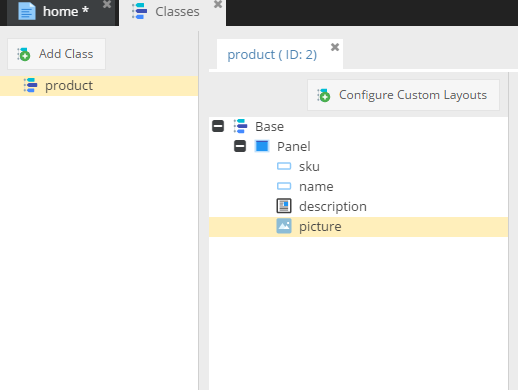 $this->relation('product') is one of the possible editable placeholders. It can be used to make 1 to 1 relations, a cool alternative for that, would be also the Renderlet editable. 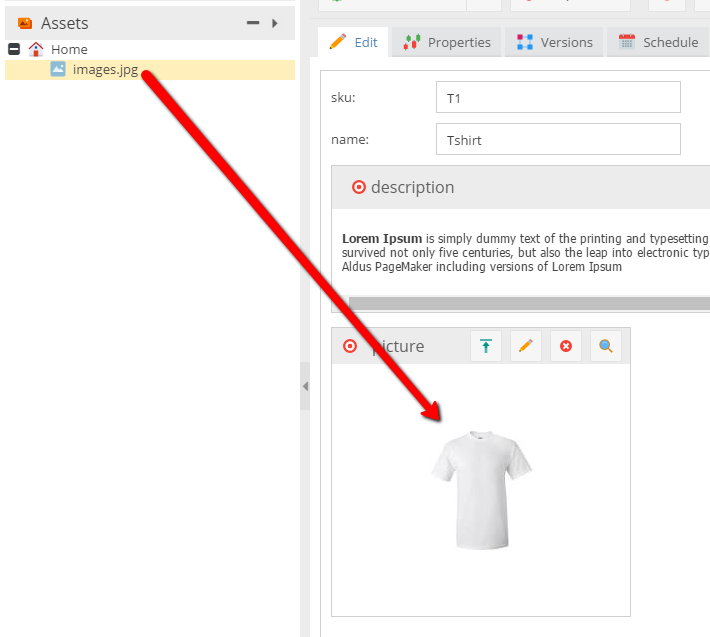 Now you can see the new editable element (relation) which we added in the product template above. 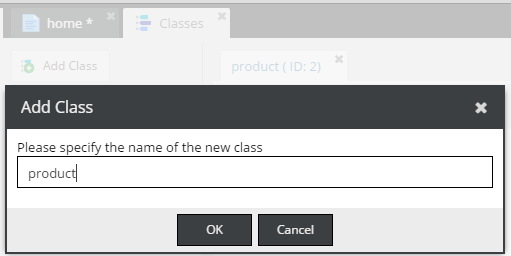 Drag the product object to that editable and press Save & Publish.